2018 Yuejin Lantern Festival｜Once a year, let's meet in Yanshui. Once a year, let's meet in Yanshui. 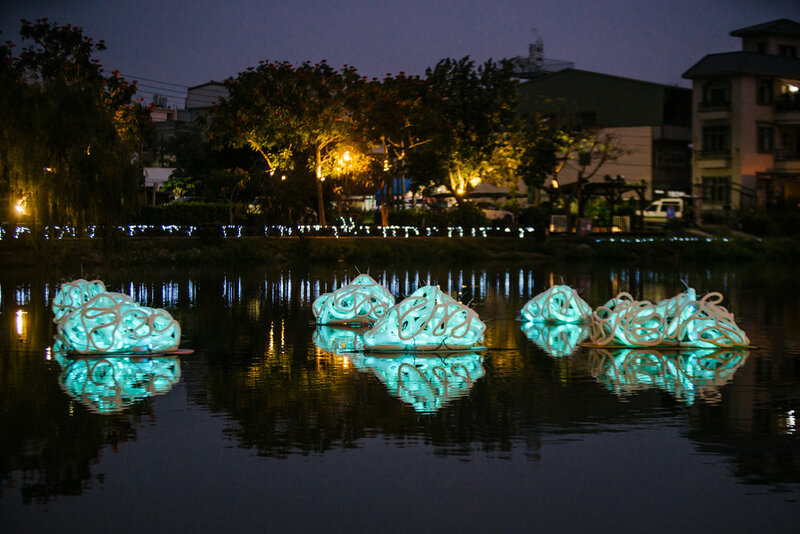 The Yuejin Lantern Festival 2018 hosted by the Cultural Bureau of Tainan City Government and curated and executed by Urban Art Studio, features the beauty of light integrated with the local scenery and turns into land art that creates a unique artistic ambience. 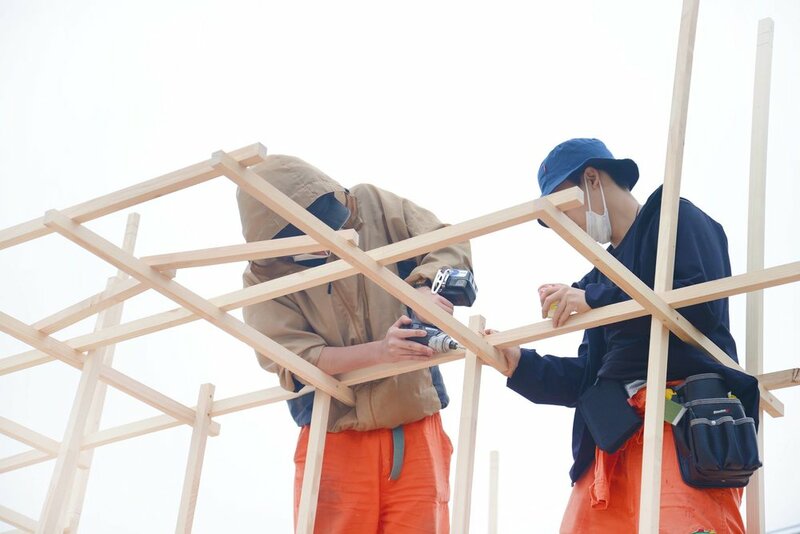 With the theme of " Rendezvous ", the Lantern Festival 2018 will invite contemporary artists to participate in the exhibition, new technology and new media professionals from home and abroad included. 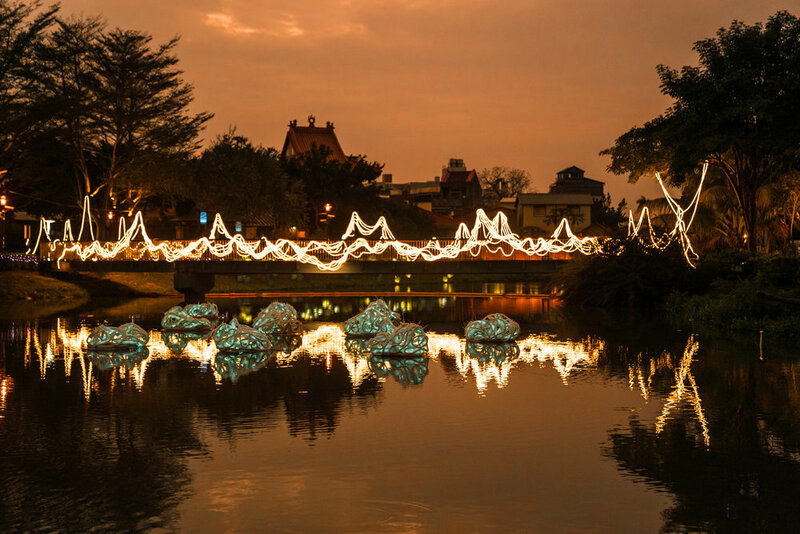 The Festival 2018 combines local culture with scenery of Yanshui by the form of installation artworks of light and makes an appointment with citizens by art in a romantic way. In our perceivable space, myriads of border-crossing actions have been taken in a creeping and constant manner. 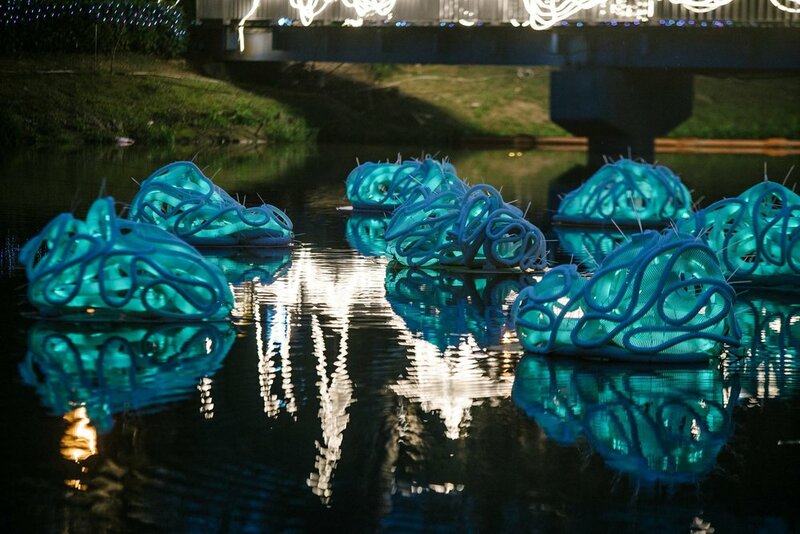 The team created Unrelated, a translucent visual installation, with bamboo, timber, iron, steel wire and LED lights, and then installed it on the surface of the water. The vertical bamboo slices interweave the real and the virtual in this space and produce a riveting intersection of shadow and light in the night breeze. As far as the team is concerned, life per se is essentially featured by a concatenation of encounters, seemingly unintentional yet in fact causally related. Those seemingly unrelated happenings could be the results of predestined appointments. Moonlight Fruits are cultivated collectively by moonlight and the mist over the Yuejin Harbor. At the harvest season, the blue and green fruits ripen in clusters, coated with glassy surfaces and emitting fluorescent light during the night. They lay strewn along the waterfront of the Yuejin Harbor, bending in the wind and drifting with water. 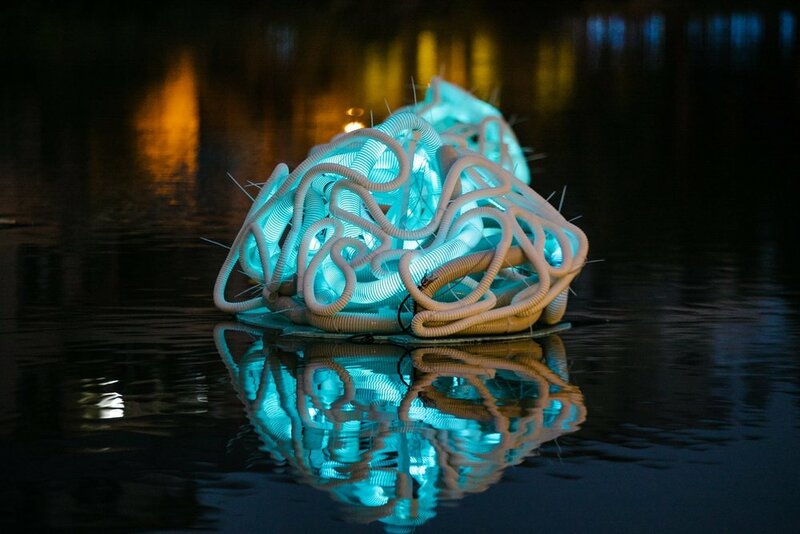 YiYe Design placed several lighting installations different in shape and color. Their peculiar, thought-provoking shapes glow in the dim light of night, making themselves nothing short of fruits from other planets. 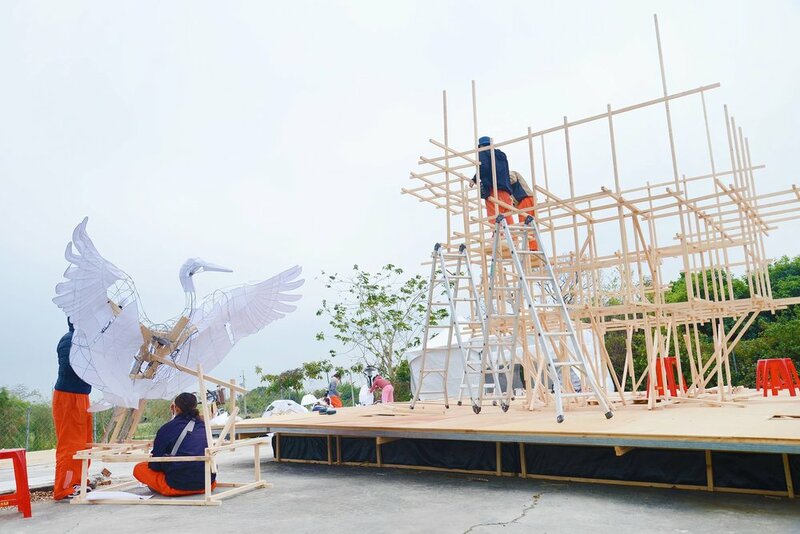 The artist’s fertile imagination harmoniously blended with the breathtaking scenery of the Yuejin Harbor, giving the visitors a new-found sense of space.